The psoas • sō -əs • is part of the iliopsoas muscle group, which plays a key role in healthy alignment, stability and efficient movement. Its proper training commonly relieves back and pelvic pain. 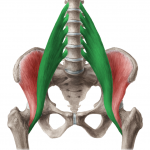 The psoas major as a true core muscle hugs the lumbar spine, the iliacus is our most important hip flexor. The psoas is connected to the diaphragm, and the kidneys are gliding on the psoas. It shortens when you sit a lot, tightening your hips and lumbar spine. It fires with stress and is related to emotional trauma. Releasing the psoas is wonderful to improve overall mobility, flexibility, breathing, release lower back and hip joints. But as it connects to the latissimus dorsi your will get more mobility in arms and shoulders as well. A Psoas workshop is very beneficial for nearly everyone. achieve insight into functional anatomy in acreative, playful manner. learn the true functions of psoas major, minorand iliacus. discover why the transversus abdominis is reallya back muscle. learn how the abdominals amplify the function ofthe erector spinea. enjoy full flexibility in hip joints and spine. create ease in sitting, walking and running. This approach, which is based on fundamental scientific research, brings a much improved efficiency to all physical treatment, training and rehabilitation.